Place kale in your serving bowl. Sprinkle sea salt all over kale and massage into the kale for 1-2 minutes. The massaging is what really helps to tenderize the kale. Sprinkle with the lemon juice and set aside. When ready to serve. Heat up butter in a skillet, add corn and sauté until warm and beginning to brown slightly. Add tarragon and the toss in with the kale. And enjoy!! The garden is producing food faster than we can eat it!! Two of the most abundant crops other than tomatoes are kale and corn. One day I was having some people over for dinner and I didn’t have any fixings for a green salad so I decided to use my Kale. But Kale is so tough. 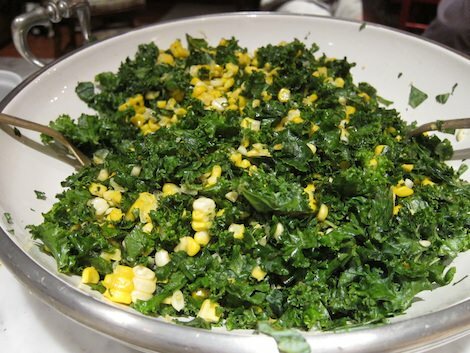 I remembered reading that salt and lemon tenderized the kale…and the rest is history….my Corn and Kale Salad recipe was born. Simple, delicious and healthy!! If you don't have corn, just dress the salad with a sweet and tangy dressing, made with a little honey, tarragon vinegar and olive oil.